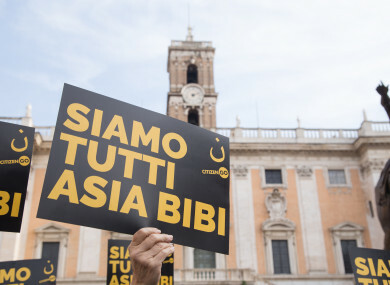 Solidarity sit-in for Asia Bibi in Rome organised by the CitizenGO Italia Foundation last year. PAKISTAN’S SUPREME COURT today rejected a challenge against its decision to acquit Asia Bibi, lifting the last legal hurdle in the years-long blasphemy case and potentially paving the way for the Christian mother to leave the country. “Based on merit, this review petition is dismissed,” Chief Justice Asif Saeed Khosa told a hearing at Pakistan’s highest court, which overturned Bibi’s death sentence for blasphemy last year. The ruling ignited immediate calls from activists to allow her to leave the country, where she remains a prime target with the government refusing to reveal her whereabouts and Islamist extremists calling for her murder. Authorities struck a deal to end the violence which included allowing the petition seeking an appeal against the Supreme Court’s judgement. Earlier today, the Tehreek-e-Labaik Pakistan (TLP) party, which led violent protests demanding Bibi’s execution after her acquittal, called for its members to be ready for action in a message sent to journalists. But most of its leaders remain in detention after a government crackdown, and few protesters could be seen at the court in Islamabad, where security appeared as normal. That did not prevent those who did show up for the hearing from calling for violence against Bibi prior to the court’s ruling, however. “She deserves to be murdered according to Shariah,” Hafiz Ehtisham Ahmed, an Islamist activist linked to the extremist Red Mosque in Islamabad, told AFP. Bibi’s lawyer Saif-ul-Mulook, who returned to Pakistan over the weekend after spending weeks abroad in the wake of his client’s acquittal, dismissed the petition as “frivolous” as he walked into the court. The three-member bench hearing the petition was be headed by new Chief Justice Asif Saeed Khosa — considered the country’s top expert in criminal law — who helped draft the decision to acquit Bibi. Email “Pakistan rejects challenge against Asia Bibi blasphemy acquittal”. Feedback on “Pakistan rejects challenge against Asia Bibi blasphemy acquittal”.